A subject prepares to be tested on the Reduced Gravity Walking Simulator. 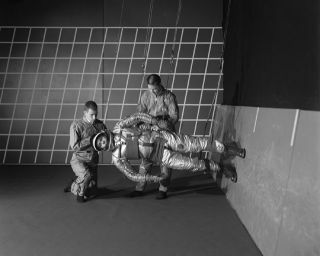 In this historical photo from the U.S. space agency, a test subject is suited up for studies on the Reduced Gravity Walking Simulator on Dec. 11, 1963. The simulator is located in the hangar at Langley Research Center. The initial version of this simulator was located inside the hangar. Later a larger version would be located at the Lunar Landing Facility. This position meant that a person's legs experienced only one sixth of their weight, which was the equivalent of being on the lunar surface. The purpose of this simulator was to study the subject while walking, jumping or running. Researchers conducted studies of various factors such as fatigue limit, energy expenditure, and speed of locomotion.